Open databases in the Timeline - Work with as many databases as you need in a single timeline. 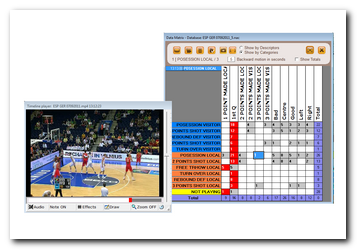 Change the start or end of a clip - Users will be able to change the duration of a register using their own criteria. Temporary displacement of clip - Move a register within the timeline without affecting its length. Data matrix - A data matrix allows you to see the numerical relationship between categories and descriptors. Actions searcher - Find specific registers within your databases using this powerful tool so you can set search filters. The search can be made within one game or all the season’s games, without limits. 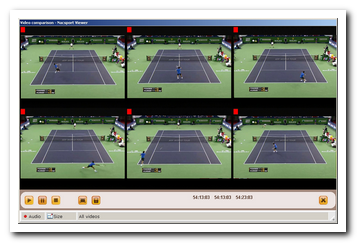 Compare up to 8 actions - Compare up to 8 different video clips from the timeline simultaneously. Show a presentation - Open a presentation to review it. You will be able to check notes and descriptors associated to a register as well. Import/export XML files - Import XML files from other systems with timeline based products and export Nacsport databases to this format. Print or export reports to MS Excel® or PDF - You can export in two ready to present formats: registers ordered chronologically or ordered by category with totals of information included. You can also export different XLS format files for deeper statistical analysis in Excel for example. Zoom over videos - Zoom in/out of images during video playback. You will be able to extract the zoomed frame to save it or insert it into the video.